This retro industrial collection reminiscent of turn of the 19th century lighting, features Brushed Steel and Dark Bronze finishes. The larger pendants are accented with Pearl Glass and a special touch of light in the open work casting above the beautifully shaped domes. 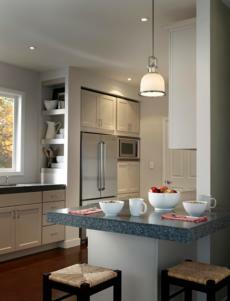 Group the pendants over a kitchen isle or introduce a fresh, bright look to your dining room or kitchen table. This group casts a beautiful warm light wherever they are hung. Add one of the coordinating mirrors to complete the fashionable look of your room. Lamping: (1) Medium A19 100w Max.